These past few months have been big for Beats by Dre. The company was recently purchased by Apple, making founder Dr. Dre that much closer to becoming hip-hop's first billionaire. But before his accounts enter the nine-figure mark, Beats has scooped up another high fashion collaboration. 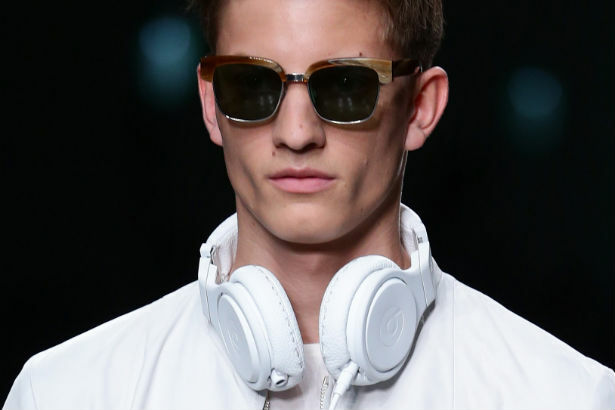 Fendi's teamed up with them on a range of headphones, a sampling which showed during the label's menswear show earlier today. The collection will offer over-the-ear leather headphones stamped with the Fendi emblem in a range of colors: red, yellow, blue, black, green and gray, with a black croco option if you're fancy. As for pricing, nothing's set in stone but according to a Fendi spokesperson, you might have to shill out about $1,300 for a pair. To borrow a phrase from Drake: that's luxury, dawg. You won't be able to get your hands on them until later this year, but they are pretty swagged out.